Pursuing your dream of owning your own business is a big decision. We encourage you to learn as much as you can about buying a franchise before making that decision. We have prepared this information to answer some of the questions about franchises for sale that are asked by potential franchisees just like you. Franchising is a business model where a buyer (the Franchisee) follows the successful business model (System) of the seller (the Franchisor). Buying a franchise saves time, requires fewer resources and yields higher success rates than other start-up businesses. 2. 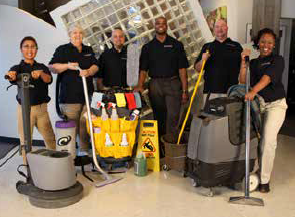 Why Choose a Commercial/Janitorial Cleaning Franchise? A commercial cleaning franchise can be started with a low cost investment and a wealth of opportunity exists to grow a profitable franchise business. 3. How Much is the initial investment? We offer a variety of franchise revenue plans to choose from that start with a down payment as little as $950. We will explain all of your low cost options and help you determine which plan is the best fit for you. 4. Will I need all the money up front? Depending upon the plan you choose, you can combine your funds with our partial financing to make your initial investment. 5. Can I start part time and then grow? Yes you can! We encourage franchisees to start with a plan that is comfortable and then grow through our flexible processes. We are happy to explain these processes to you. 6. Do I need sales experience to be successful? We will manage the sales process and provide your customers for you. However, you can find your own customers too. 7. Do I need business management skills? We offer support in sales, marketing, billing and collections so that you are able to focus on customer service. Our comprehensive five-week training and ongoing support will help you with all aspects of launching and growing your new business. 8. Do I need commercial Cleaning experience? No. Our training program and ongoing support will provide you with cleaning and safety techniques as well as customer service skills. 9. Where do I get the supplies, equipment and Insurance that I need? We have developed trusted relationships with suppliers for these things and you have the option of utilizing those suppliers. 10. What kind of buildings will I clean? Commercial cleaning includes office buildings, medical facilities, banks, car dealerships, etc. It does not in-clude residential buildings. 11. Can my family work with me? Yes. Some of our most successful franchises are operated by family teams. 12. How can I be most successful in this business? Our most successful franchisees know that satisfied, loyal customers are the most important ingredient to success. They commit their time and energy to doing things right every day. There is more to learn about running a profitable business, so we invite you to meet with us to ask your own questions and get all the information you need to make a wise decision for you and your family.